How do I use the American Legend Visualizer? Also known as tapered seat, or conical wheel nut. They’re a modern, OEM-style wheel nut that utilizes a tapered, cone-section on the end that matches the conical seat machined into the wheel’s lug hole. It differs from a lug nut which does not have the tapered cone section, rather a long parallel shank that extends into the wheel’s center – see Lug Nut. A high-grade of aluminum that has been heated treated to T6 specifications for greater strength. It is certified for use in aircraft as it is easily worked, highly corrosion resistant and loses minimal strength when TIG or MIG welded. These attributes combined with its suitability for forging makes it an ideal wheel material. The measure of force exerted by the air inside a tire, typically measured in pounds per square inch (PSI), or kilopascals (kPa). All tires have a recommended inflation pressure. Adjusting the vehicle’s suspension components so that the tires point in the ideal direction and sit at the correct angle for optimum steering and tire life. The three common alignment settings are caster, camber and toe. Also referred to a tire’s profile or series. It is the ratio of a tire’s sidewall height to its section width (i.e. the 45 in 235/45R17 indicates the height of the tire’s sidewall is 45% of its section width, or 105.8mm). Tires that have a different tread pattern on one side of the tire than the other. Due to their tread design, Asymmetric tires are invariably classified as ‘directional’ (see Directional). Sometimes called rear space and often incorrectly referred to as offset (see Offset). Backspace is the measured distance from the wheel’s mounting pad to the very back edge of the rim (not the bead face). Although related, backspace should not be confused with offset. A process typically carried out once the tires are mounted on the wheels. An imbalance will cause the vehicle to vibrate, or wobble, as well as wear the tires unevenly. To bring the tires into balance, small lead weights (wheel weights) are added to the circumference of the rim. Also known as a hoop. It’s the cylindrical, tube-like section of a wheel. The center attaches into the barrel to form a complete wheel. The edge of the tire that sits in the small indent (bead seat) at the outermost edges of the rim. Made from a round hoop of high tensile steel wires that encircle the edge of the tire, the bead is designed to hold the tire securely in position on the rim’s bead seat – even when driven on when deflated. Outermost sections of the rim, against which the tire’s bead sits when mounted (see Bead). The small indent (groove, or recess) at the outermost edges of the rim. Once mounted, the tire fits tightly into this small indent creating an air-tight seal. (see Bead, Bead Face, Seating/Breaking the Bead). Also see run flat. Also known as cross-ply. An older type of tire construction phased out on production road cars during the early 1970s. Here the tire’s individual layers of plies are layered on top of each in a crisscross pattern. Although superseded by radial tires for passenger cars, bias ply construction is still commonly used in off-road and truck tires, as well as many types of racing slicks. Refers to the machining of an object from one solid piece of material. The centers of American Legend two and three-piece wheels are machined from a forged billet (see Forged). Also referred to as stud pattern, bolt circle, or PCD. This describes the total number of studs, along with the diameter of the imaginary circle that passes through the center of the studs (or bolt holes). Generally stated as 5 on 4 ½, or 5×4½ – metric equivalents include 5×114.3 and 5×120.6. The first number refers to the number of studs/bolt holes, while the second number is the diameter of the imaginary circle that passes through the center of each stud/hole. On many late high-performance machinery, as well as traditional muscle cars fitted with extreme brake upgrades, the brake caliper can protrude (or stick out) past the wheel mounting face. Under these conditions, the wheel’s spokes must curve out and around the brake caliper to provide adequate clearance. To measure, place a straight-edge on the caliper, so that it’s parallel to the hub mounting face and measure the distance. If the straight edge can sit square against the hub (i.e. wheel mounting face) and does not contact the brake caliper, your vehicle has no (or negative) ‘Caliper Stick Out’, or ‘Poke Out’. Described as positive or negative; it’s the angle of the tire relative to vertical. Negative camber is when the top of the tire is tilted inwards towards the center of the car. Positive camber is when the tire is tilted outwards. A standard-quality wheel manufacturing technique, where molten metal is poured into a mold that is the final shape of the wheel. This manufacturing technique produces low and inconsistent material density along with air pockets – both of which decreases a wheel’s overall strength and longevity. 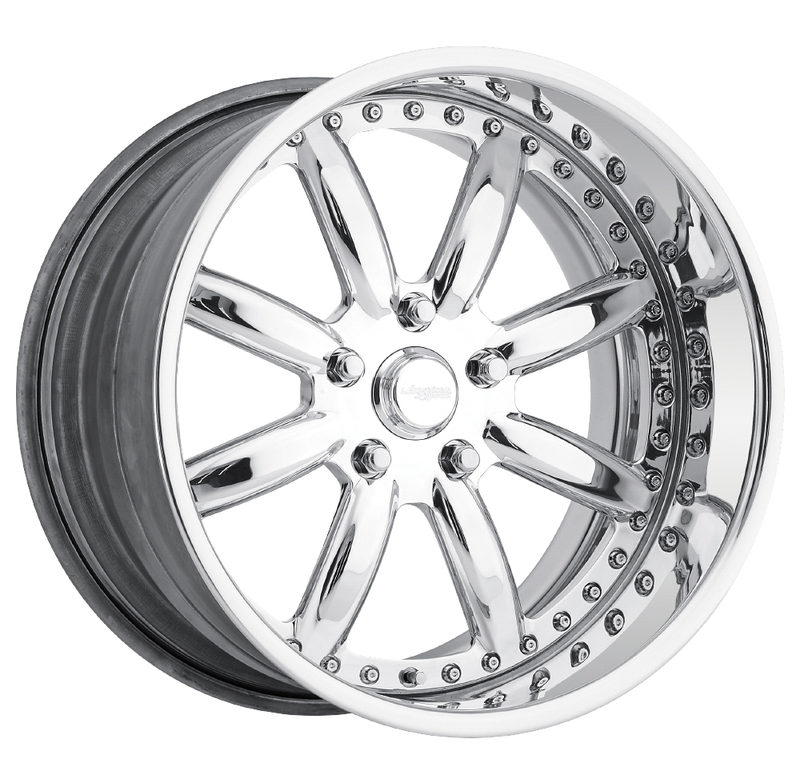 *Note: The Pressure Casting technique used by American Legend Wheels is a superior manufacturing technique. Looking at the vehicle side-on; it’s the imaginary line the runs between the suspension’s top and bottom pivot point. The tire swivels about this axis when turned. The round cap that covers centerbore hole. 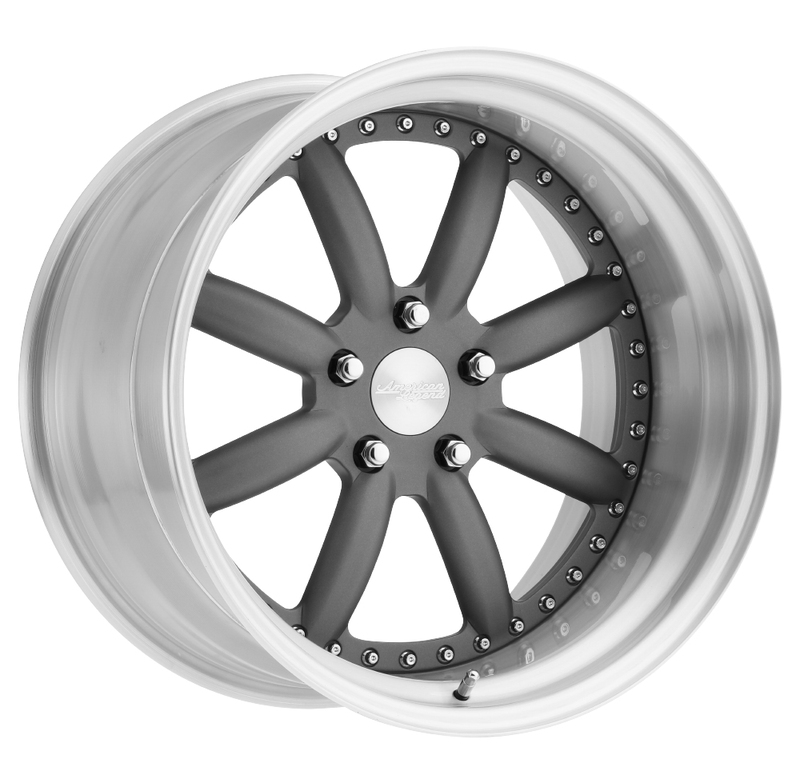 Depending on the wheel design selected, American Legend Wheels offers center caps in several different designs, styles and finishes. The perpendicular, disc-like portion of the wheel that bolts to the vehicle’s hub. The outer rim halves, hoops or barrel attaches to the center piece to form a complete wheel. Also known as the center hub. This is the large hole (mounting spigot) at the very center of the wheel. It’s designed to precisely center the wheel on the vehicle’s hub (i.e. hub-centric) to ensure there is no run out when bolted in place. The centerbore on some wheels is machined oversize, employing hub rings for a hub-centric fitment. CNC is an acronym for Computer Numerical Control. This automated machining process results in incredibly accurate results with unwavering repeatability. American Legend Wheels are CNC machined to ensure the highest possible accuracy, unparalleled repeatability and unwavering quality. Also known as footprint. The section of tire that contacts the surface of the road. Also known as Bias-Ply. An older type of tire construction phased out by the early 1970s on passenger cars. In a Cross-Ply tire, the individual layers of plies are layered on top of each in a crisscross pattern. Although superseded by radial tires for passenger cars, bias ply construction is still commonly used in off-road and truck tires, as well as many types of racing slicks. The damage caused to a rim when scraped against the curb, or gutter. Where the center of the wheel is positioned well back from the front edge. Wheels with a small/low backspace, or negative offset invariably have a deep dish. Also known as Measured Width. Every tire can be mounted on a range of manufacture recommended rim widths. The wider the rim, the wider the tire’s overall width (section width) becomes. The Design Rim, or Measured Rim, is the rim width on which the tire is mounted when determining its size specifications – as indicted on the sidewall. Some tires are designed to rotate in only one direction. This direction is typically indicated on the sidewall with an arrow and text. It is important to mount directional tires on the correct side of the vehicle, so that they rotate in the correct direction. An acronym that stands for U.S. Department of Transportation Motor Vehicle Safety Standards. Tires must carry DOT approval to be used on a public road. The 10-digit DOT code incorporates information such as; manufacturer, manufacturing plant, tire line, size, plus week and year of manufacture. Similar wheel certification schemes include; JWL (Japan) and TUV (Germany/Europe). Some wheels have more than one set of bolt holes, which allows the same wheel to be fitted to vehicles with a different bolt pattern or PCD. The process of balancing the wheel and tire assembly by spinning it up in a specialized wheel balancing machine. The point of imbalance is determined, with leads weights added to the rim circumference to bring the wheel and tire assembly back into neutral balance. Refers to a wheel’s offset (see Offset). Comes from the German word, Einpresstiefe, which translates to insertion depth. The combination of the critical parameters including; width, offset, bolt pattern, center bore and brake caliper clearance that is specific to each particular vehicle. Considered to be the optimum wheel manufacturing technique. The forging process compresses an ingot of aluminum into the desired shape using heat and millions of pounds of pressure. The result is a wheel that is both stronger and lighter. American Legend Wheels offers forged billet wheels in both two-piece and three-piece configurations. Also see ‘Billet’. Virtually all front-wheel-drive vehicles employ a high, positive offset design wheel. For this reason, any wheel with little to no dish is often described as having a ‘front-wheel-drive offset’. *Note: many late-model, rear-wheel drive vehicles are factory fitted with wheels featuring a high, positive offset design. The damage caused to a rim when scraped against the gutter or curb. The point of the vehicle to which the wheel bolts up to. A situation wherein the centerbore of the wheel is made to match up with the diameter of the vehicle’s hub. This arrangement accurately centers the wheel for zero run-out. Also, with a hub-centric fitment, vertical loads are carried by the hub (hub-spigot) rather than the wheel studs. Hard plastic or aluminum rings mounted on a vehicle’s hub (or in the wheel’s centrebore) to create a hub-centric fitment on wheels with an oversized centerbore. The section of rim (hoop, rim half) behind the wheel’s center. A set of requirements for light alloy wheels set down by Japan’s Ministry of Land, Infrastructure, Transport and Tourism. Any wheel to be used on passenger vehicle in Japan must be certified and bare the JWL mark. Similar certification schemes include; DOT (USA) and TUV (Germany/Europe). An acronym for Kilopascals, which refers to the pressure a tire is inflated too – psi is the imperial equivalent (1kPa = 0.145psi) – see psi. The maximum weight a passenger car tire is rated to carry. The vehicle manufacture will indicate on the tire placard the minimum load rating of any tire that may be fitted to that vehicle. Tires with a higher load rating may be fitted but not a lower rating. *Note: both tires and wheels have load ratings. A vehicle’s wheels must be capable of carrying the vehicle’s fully loaded, maximum weight. Wheels are individually load rated – multiply a wheel’s rating by four to determine if the selected rim is of sufficient rating for your vehicle’s maximum, fully loaded mass. *Note: both tires and wheels have load ratings. Also known as a flange nut. While often incorrectly used to describe a tapered seat, conical seat, or Acorn style wheel nut, lug nuts can be identified by the long parallel shank section that extends into the wheel’s center. This type of wheel nut is still commonly used on drag racing style wheels, as well as older-style mag wheels and must be used with a flat washer. Not to be used with wheels machined for tapered/conical seat wheel nuts. Highly-polished, raw aluminum that has the appearance of chrome. A term used to describe a forged, one-piece wheel. Here heat and millions of pounds of pressure are used to compresses an ingot of aluminum into the desired overall shape. *Note: a term not typically used to describe one-piece, cast wheels. The process of installing the tires onto the wheels. Also known as ET. It’s the measured distance (in millimeters) from the true centerline of the wheel to its mounting face. A positive number (Positive Offset) will be generated when the mounting face is towards the front of the wheel (i.e. shallow dish). While a negative number (Negative Offset) will be generated when the mounting face is towards the rear of the wheel (i.e. deep dish). A wheel that has been manufactured by pouring or forcing molten metal into a mold that is the final shape of the wheel. See Pressure Cast wheel. *Note: a term not typically used to describe forged, one-piece wheels. Here the term Mono-Block (see Mono-Block) is more commonly used. The section of rim (hoop, rim half or barrel section) in front of the wheel center. The overall, outside diameter of an inflated tire without any load on it. An acronym that stands for Pitch Circle Diameter – also referred to as bolt circle, bolt pattern, or stud pattern. PCD is the diameter of the imaginary circle that passes through the center of the studs – or the wheel’s bolt holes. This figure is usually accompanied by the number of studs, or bolt holes. I.E. : 5 on 4 ½, or 5×4½ (for a 4 ½-inch PCD). Metric equivalents include 5 on 114.3, or 5×114.3 (114.3mm PCD). The first number refers to the number of studs/bolt holes, while the second number is the diameter of the imaginary circle that passes through the center of each stud/hole. Also called assembly bolts. These are the fasteners used in American Legend’s three-piece wheels to bolt the center into the inner and outer rim halves. American Legend offers the option of having traditional exposed perimeter bolts, or hidden perimeter bolts that are fastened from behind. A guide-system that enables you to enhance the performance and looks of your car through the fitment of larger-diameter, lower-profile tires – while keeping the overall diameter within 3% of the factory-fitted tire. Selecting a tire with an overall diameter that’s greater, or lesser than 3% may result in problems with speedometer accuracy, transmission shifting, fuel economy and tire-to-body clearances. A tire designed to be inflated with pressurized air. With American Legend’s Pressure Cast wheels, the molten metal is forced into the mold under high pressure to eliminate air pockets, while producing a denser, stronger, higher-quality wheel. Most low-quality, cast wheels use a gravity-fed manufacturing procedure, where the molten metal is poured into the mold. Gravity casting commonly creates weaknesses such as air pockets and inconsistent material density. Also referred to a tire’s Aspect Ratio. It is the ratio of a tire’s sidewall height to its section width (i.e. the 45 in 235/45R17 indicates the height of the tire’s sidewall is 45% of its section width, or in this case 105.8mm). A street driven vehicle that has been built to resemble a drag car, with an emphasis on straight line performance. This style is typified with extreme rake along with narrow tires up front combined with tall, wide tires on the rear. A style of classic muscle car with an emphasis on cornering, handling and braking performance. The style is typified with 17-inch or larger wheels combined with fat, low profile tires all ’round. An acronym for Pounds Per Square Inch, A common measurement unit for tire inflation, it represents the force exerted by the air inside a tire – kPa (Kilopascals) is the metric equivalent (1psi = 6.9kPa). Tires built with its plies (belts) running perpendicularly across the face of the tire. This arrangement adds significant strength to the tread. *Note: While radial tires do utilize circumferential belts (plies) that run around the tire, their purpose is more about holding the main, radial plies in place. Also called a flat or soft lip. Wheels with this feature have a smooth, flat hoop that runs from the center all the way to the outer rolled edge – with no step at all. Reverse/Smooth lip design allows for a bigger center to be fitted than is possible with a traditional, step-lip configuration. A more contemporary design that makes the wheel look deeper and larger in diameter. Also called a tire drop, or drop center. Looking at the rim in end-on profile, it’s the smaller diameter section that dips down towards the center. The tire’s bead drops down into this section, enabling it to be mounted onto the rim. The very outer section of the wheel barrel. Also used to describe the outer rim section in a three-piece wheel. The bead-face to bead-face measurement. Also known as the width between the rim’s flanges. Both typically expressed in inches (even in metric countries) and both typically rounded to the nearest half inch. Not to be confused with the outer-rim-lip, to outer-rim-lip measurement which will always be greater. Every tire has a manufacturer-recommended minimum and maximum wheel width. Also known as self-supporting tires. Run Flat Tires are specially designed with reinforced sidewalls to resist the effects of deflation when punctured. Most can be driven 50 to 100 miles (80-160km), at a reduced speed of up to 50mph (80km/h) with no air in them. Run Flat Tires feature a double safety bead system to securely anchor the tire in place. While it is acceptable to fit non-run flat tires to run flat rims. However due to the double bead, you cannot fit run flat tires on non-run flat (regular) rims. An acronym for Society of Automotive Engineers. A globally active professional association that establishes international engineering safety standards along with fitment standardization for various industries, including automotive wheels. The tire’s bead is a very tight fit onto the rim’s bead seat – it takes considerable force to seat the bead (when fitting the tire) or break the bead (when removing the tire). To seat the bead, the rim is lubricated (typically with soap) and the tire filled with compressed air until the tire’s bead pops up over the small ridge (see bead seat), dropping snugly into the bead seat. To break the bead (i.e. pull the tire’s bead away from the edge of the rim) is typically done with a special clamping machine that squeezes on the tire’s sidewall, pulling the tire’s bead away from the edge of the rim. Always wider than the tread width. It’s the overall, sidewall-to sidewall width of the tire when inflated – and not under load. Tires are often referred to as being a; 60, 50, 45, etc series tire. The numbers refer the tire’s Profile or Aspect Ratio (See Profile or Aspect Ratio). The point on the tire where the tread and sidewall meet. The side portion of a tire between the tread and the bead. Small slits in a tire’s tread that helps disperse water from under the tire for improved wet weather traction. Sipes have also proven to create biting edges for extra traction in ice and snow conditions. The maximum speed at which a tire has been rated to safely operate at – Provided it’s in good condition, correctly fitted and correctly inflated. Performance passenger car tires have the following speed ratings: H (210km/h), V (240km/h), Z (240km/h), W (270km/h), Y(300km/h). Also called a window accent. This is small detailed section (rebate or groove) that runs around the edge of each, individual spoke. All the outward-facing surfaces of the wheel’s center. Where a vehicle uses wheels with a different width and/or diameter front to back. Common staggered fitment is to opt for a wider (and/or larger diameter) wheel on the rear. A more traditional design, where the outer rim section has one or two steps on the outer lip (i.e. : it is not smooth like a reverse/soft/smooth lip rim). Also referred to as bolt pattern, bolt circle or PCD. This describes the total number of studs, along with the diameter of the imaginary circle that passes through the center of the studs (or bolt holes). Generally stated as 5 on 4 ½, or 5×4½ – metric equivalents include 5×114.3, 5×120.6. The first number refers to the number of studs/bolt holes, while the second number is the diameter of the imaginary circle that passes through the center of each stud/hole. Also known as Acorn or conical wheel nut. They’re a modern, OEM-style wheel nut that utilizes a tapered, cone-section on the end that matches the conical seat machined into the wheel’s lug hole. With modular, three-piece wheels, the outer rim section is constructed from two separate inner and outer halves (inner/outer lips, hoops, or barrels) that are bolted to the center piece to create a complete wheel. *Note: Also see Two-Piece Wheel. The nominal diameter (i.e. 17-inch, 18-inch, 20-inch, etc) of the rim the tire is specified to mount onto. Only ever combine wheels and tires that have the same diameter specification. Since the late 60s vehicle manufactures have affixed an information label inside of the door jamb, door pillar, fuel filler door, or glovebox that identifies the original equipment tire size and recommended operating pressure. *Note: the pressure rating imprinted on the tire’s sidewall indicates the maximum inflation pressure, not the manufacture’s recommended operating pressure. The physical measurement of how much the front tires are pointing inwards (toe in) or outwards (toe out) from each other. Refers to tighten the wheel nuts. Proper torque sequence is vital to correctly center the wheel bolting it onto your vehicle. Begin by nipping up the wheel nuts in a cross-hatch pattern, before making a second pass, tightening the wheel nuts to the recommended torque specifications. The measured distance between the center line of the front, or the rear tires. On most vehicles, the track width will differ from front to rear, as they perform different functions. The patterned section that runs across the face of the tire – the section which contacts the road (see Tread Pattern). The distance from the top of the tread to the bottom of the tire’s grooves. The arrangement of grooves, blocks, sipes, and channels on the surface of the tire. Tire manufacturers continually develop updated tread designs to enhance traction, tread life, rolling noise and wet weather performance. Always narrower than the overall section width. This is the tire’s shoulder-to-shoulder width and is the section of tire that contacts the road surface. A German/European certification standard that verifies a product has met applicable safety requirements and quality standards. Similar certification schemes include; DOT (USA) and JWL (Japan). A wheel constructed using a center piece typically welded (sometimes bolted) into a one-piece hoop (or barrel) to create a complete wheel. *Note: Also see Three-Piece Wheel. American Legend’s innovative desktop tool that enables you to see what the full range of American Legend Wheels – in all the various diameters and available finishes – will look like on your vehicle. You can either upload images of your own vehicle or use an existing image from American Legend’s massive archive. 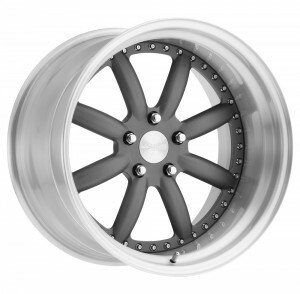 The Visualizer even allows you to customize the look and finish of your wheel. Also called Tread Depth Indicators. At a few points on the tire you will note small, low-lying bars that bridge individual tread blocks. The tire should be replaced once the tread blocks have worn down to these, small bridged sections. Sometimes also incorrectly referred to as a wheel spacer (see Wheel Spacer). An adaptor differs from a spacer in that an adaptor bolts to the vehicle’s original studs, then has its own, secondary set of studs set into the adaptor onto which the wheel bolts. Often utilized to mount wheels with different stud patterns or to widen a vehicle’s track. The distance between the centerline of the front and rear wheels. Vehicle’s that are longer overall, tend to have a longer wheelbase. Small vehicles tend to have a short wheelbase. The nominal diameter of a wheel (i.e. 17-inch, 18-inch, 20-inch, etc.). The measurement actually refers to the diameter measured at the bead seat – not the outer rim lip itself (*Note: the outer rim lip will always be larger). Only ever combine wheels and tires that are designed for the same wheel diameter. A plate with holes drilled in it, which simply slips over the vehicle’s wheel studs to move the wheel outwards (i.e. widen the vehicle’s track). Small weights that are added to the inner or outer sections of the rim to bring the wheel into balance – which minimizes the potential vibrations when driving. These weights (usually lead) are clipped, taped or self-adhered to the rim. All the surfaces on the center of the wheel that are at 90 degrees to the spoke face (i.e. the edge of the spokes). A condition where the wheel’s mounting surface is at the exact centerline of the wheel. Also see Offset. Now that you’re wheel and tire guru, take the time to browse American Legend’s range of one-piece pressure cast wheels and premium-quality, forged-billet 2 and 3-piece wheels. You’re sure to find a style and size that will transform your ride into the ultimate muscle machine. Where Do I Take Damaged Rims? Contact us directly or return the damaged rims to a American Legend specialty dealer. Many safety issues arise when servicing rims. Warranties are voided on rims serviced at non American Legend approved shops. Satin suede is a sand blasted finish best cleaned with a quality glass cleaner and a clean microfiber cloth. Keep wheels clean avoiding damage to the wheels finish. Do not use harsh cleaning chemicals. Do not use pressure or steam cleaners. Clean when cool with mild soap, water and non-abrasive cloth. Once cleaned, dry with a clean and non-abrasive towel. Keep wheels clean avoiding damage to the wheels finish. Do not use harsh cleaning chemicals. Do not use pressure or steam cleaners. Clean when cool with mild soap, water and non-abrasive cloth. Once cleaned, dry with a clean and non-abrasive towel. Repolish after cleaning with a quality aluminium wheel polish. Keep wheels clean avoiding damage to the wheels finish. Do not use harsh cleaning chemicals. Do not use pressure or steam cleaners. Step lip rims have one or two steps in the outer lip. The valve hole is located in the lip. Reverse lip rims feature a flat lip. The valve hole is located behind the center facing forward. © 2015-2018 American Legend Wheels | Powered by Classic Performance Products Inc.